In the year 2009, Nintendo was placed fifth in the BusinessWeek’s ranking of the world’s most innovative companies. This confirms Nintendo’s significant rearrangement into an innovative design powerhouse that redefined the predominant business value factors of the video game industry. However, a few years ago no analyst would have anticipated that Nintendo would develop in this direction. Until the mid-1990s, the global home video game console industry was dominated by Nintendo, a Japanese video game hardware and software manufacturer. Rivalry in this industry only marginally existed. This changed when Sony entered the market in 1994. By offering a console that was technologically superior, Sony outperformed the then- Nintendo console. Thereby new challenges arose for the Japanese company. Nintendo lost its long lasting market leadership to the new entrant. Despite several trails to recapture market leadership during the end-1990s, Nintendo was stuck in second place. Instead of regaining market share, the opposite was the case when Microsoft, a computer software giant, joined the market in 2001. Nintendo’s market share slipped dramatically because they were not able to keep up the technological progress of its competitors. The former market leader fell back to the third place of the industry. Analysts of the video game entertainment industry even recommended that Nintendo withdraw completely from the highly competitive console market in order to concentrate on developing software. However, Nintendo refused to surrender, but they were in biggest need to recover market share. Satoru Iwata’s statement outlines the challenge Nintendo was facing in 2002. This given, the following scientific examination will elaborate the aspect how Nintendo managed to recapture market share in the video game entertainment industry. In this regard, the thesis examines strategies on how to create competitive advantage, unique selling propositions and customer value. It especially outlines the usefulness of the Blue Ocean Theory, which serves as a strategy to identify and create new uncontested market space and new, unprecedented demand. Furthermore, the aspect of how to incorporate the selected strategic approach into a new product will be examined in the new product development process. Following the theoretical point-of-view, the practical example of the video game industry and the hardware and software manufacturer Nintendo will clarify, on the one hand, how the choice of a unique business strategy can lead to new competitive advantages, resulting in excellent own business profitability. On the other hand, this example proves that products with innovative characteristics can challenge the given boundaries, create uncontested market place and make the competition irrelevant. 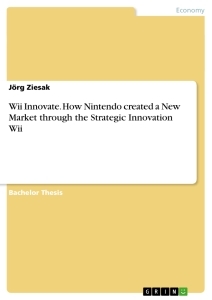 In particular, the thesis analyzes how Nintendo took advantage of the existing industry framework, which steps were necessary to develop the innovation Wii (pronounced "we") and how the new console outperformed the rivals Sony and Microsoft. Of course, this thesis is not able to cover all influences of the strategic decision and product development processes. For that reason, the theoretical part will mainly concentrate on those elements relevant to the later practical analysis. In addition to that, it is important to mention that Nintendo and the Wii can only serve as one single example what a creation of uncontested market place can look like and consequently does not claim for universal validity. The thesis consists of two major bodies - one that covers the theoretical background and one that concentrates on the practical analysis. The theoretical background starts with Chapter 2, which explains how to design a competitive strategy with the goal to create competitive advantage. According to Michael Porter, to develop a competitive strategy, a company must reflect the overall attractiveness of the industry it operates in. This happens by analyzing the industry structure according to the existence of five competitive forces. Furthermore, the own positioning within the specific industry must be considered. Porter argues that three generic strategies exist, which will be analyzed in this chapter. Moreover, Porter’s strategic approach is further developed in the Blue Ocean strategy of Kim and Mauborgne at the end of Chapter 2. After aligning a strategy to create competitive advantage, it has to be incorporated within the company’s product portfolio. Therefore, Chapter 3 outlines how new products are developed and managed by offering a sequential new product development process. In chapter 4, the second major body of the thesis starts with a market demarcation between the consumer electronics and the video game entertainment market. After this, the background of Nintendo is explained and the market that Nintendo’s new console faced at that time is analyzed by describing the industry situation, trends and upcoming challenges. The theoretical background is applied to the example by taking up the Blue Ocean Strategy that is used as the strategy for the new generation of consoles. In the following, the development of the new console is examined through the different steps of the new product development process. At the end of Chapter 4 Nintendo’s success will retrospectively be analyzed. Finally, Chapter 5 will draw a conclusion and an outlook for the near feature will be given. First of all it must be explained that many theories about how a company can achieve an advantageous position in relation to its competitors exist. The two most prevailing are the market-based-view and the resource-based-view. While the resource-based- view proposes to concentrate on own unique resources or core competencies to prevail against the competitors, the market-based-view indicates organizations to emphasize special importance on market-orientation. Regardless of which theory is chosen, “the main question in strategic management is how firms can gain and sustain competitive advantage that differentiates them from their competitors.” This paper will concentrate on the market-based-view on competitive strategy and advantage, which will be explicitly discussed in the following. According to the market based view, competitive advantage is a result of industry conditions and the resulting competitive strategy. Strategy is based on the ‘outside-in­perspective’, so corporations concentrate on external success factors and anticipate their own strategy out of the context of changing industry environment. Companies analyze the external industry environment to identify an own competitive strategy. The main criticism - which leads to the development of the resource-based-view - stating that the market based-view only concentrates on external success factors and neglects internal resources and competencies, will not be part of the following examination. The theoretical foundation of the market-based-view is the Mason/Bain structure- conduct-performance-paradigm, which explains competitive advantage as a result of industry structure and company’s strategic conduct. Its main characteristic is the “outside-in”-perspective, explaining that companies develop product-market-strategies in order to react to opportunities and threats of the external business environment. The first central question Porter outlines is dealing with the overall attractiveness of profitability of different industries. Porter uses the structural analysis to estimate the attractiveness of a specific industry and likewise to evaluate the effectiveness of a competitive environment. It identifies the long-run profit potential and the average industry profitability, which can vary widely across industries. The disparity of profitability across industries can be justified on a variety of influence factors, namely factors of production, manufacturing technology and rivalry vary across industries. In order to analyze the degree of competition, the industry is divided into five different segments: Threat of new entrants, rivalry among existing firms, bargaining power of buyers as well as that of suppliers, and finally threat of substitute products or services (see Figure 1). The stronger each of these forces, the higher is the level of competition in the industry. In industries where the cumulative strength of the forces is comparatively low (e.g. soft drinks and pharmaceuticals), many competitors are able to earn attractive returns. But in industries in which one or even more of these forces are signified by vehement pressure (e.g. raw materials and video games), only a few firms are able to realize attractive returns. Therefore, high forces are often likely to reduce profits, while low forces symbolize an opportunity to earn greater profits. Although high forces are likely to constrict the companies’ scope of action, industry participants may be able to influence these forces to their advantage by their choice of the strategy. Through a reasonable strategic choice companies are able to reshape the structure and attractiveness of their respective industry. Though every industry is unique and possesses an own unique structure, which means that general assumptions are nearly impossible. Analyzing the five forces helps enterprises to get an idea of possible changes in industry environments. Furthermore, it encourages companies to seek those strategic innovations which would most likely improve industry profitability. “The framework aims, in this process, to raise the odds of discovering a desirable strategic innovation”. In order to remain profitable in a certain industry, companies have to achieve an advantageous competitive position, which allows them to influence the five forces in a beneficial way or at least in a way that does not affect them unfavorably. In the following, starting with the threat of new entrants, each force is briefly analyzed to point out their respective influence on competition and profitability of an industry. New entrants cause new capacity, have a desire to gain market share and bring sustainable resources. They are threats to established industry participants because they usually enhance competition and reduce profit margins. The threat of entry is dependent on two factors: First of all, the existence of entry barriers, and secondly the probable retaliatory strike of existing competitors. The seven most important barriers to entry are described in the following. First to mention are economies of scale. They describe the reduction of production costs of a product or a service. The reduction can be explained by the allocation of fix costs on a higher quantity of goods. Since new entrants need to occupy a high market share, this demonstrates an entry barrier. Product differentiation represents another entry barrier. High levels of advertising and promotion and the resulting brand awareness and loyalty inhibit an easy entrance. Moreover, a demand for high investments to compete against existing companies can exist, so capital requirements must be regarded as another hurdle for market entrance. Another barrier that prevents easy entry to an industry are switching costs. They represent the one-time changing costs that occur when buyers switch to another competitor. If those are high, buyers are unlikely to change suppliers unless the new ones offer a wide range of advantages. New entrants also need access to distribution channels. On the one hand, new entrants can invest in gaining access to existing distribution channels or on the other hand, if the established market members occupy all available distribution channels, they have to build up new ones. Both methods are related to high costs and reduced profits. Additionally, cost disadvantages exist that are independent of scale. Existing companies have already established themselves in the industry, so new entrants would lack of experience in resourcing, production, distribution and marketing. Finally, government policy embodies the last entry barrier to mention. Governments are able to limit entry into industries by licensing requirements and other regulations, e.g. prohibition of the use of raw materials. In addition to the seven entry barriers named above, an entry will also unlikely when the industry is known for aggressive retaliation to new market members or if the industry is in a stage of maturity. Established companies would fear to lose market share and therefore would heavily attack new entrants. Naturally the existence of barriers differs from industry to industry, therefore it is impossible to generalize about which one is more important. The first factor to mention is the number and balance of competitors. Intensity of rivalry is connected to the quantity of industry participants and to the extent how equal market share and power is distributed among them. While industries with equally sized competitors often compete aggressively to outrange each other and to strive for dominance, industry structures with one big player and many smaller ones tend to show less competition, because the dominant is able to set the rules for contention. Slow industry growth can intensify competition as well. Slowly growing industries are more likely to tend to high competition because an increase in market share of one firm automatically means a decrease of another firm’s share. Another factor is high fix and storage costs. High fix costs put enormous pressure on firms to achieve the required sales volume. Therefore, it is likely that they provoke price wars among competitors which minimize the margins of the products sold and encourage competition. Additionally, a lack of differentiation and switching costs pushes rivalry. When no switching costs exist and products are only differentiated marginally, products and services look similar to customers, hence price is the only benchmark for consumers’ buying decision. Rivalry is increased when capacity is augmented in large increments. In the case that capacity can only be increased in large increments, a potential threat of over capacity exists. Capacities exceeding demand reduce prices throughout the whole industry. Diverse competitors: Companies may have different ideas about reaching their goals as well as about competition. When industry cultures and strategic ideas differ too much, companies are unlikely to agree on a framework of rules for competition. Likewise, high strategic stakes represent a factor that increases rivalry. If two or more firms regard it as strategically important to achieve success in a particular market, this desire may even lead to the willingness to sacrifice profits. Lastly, high exit barriers are to mention. High exit barriers are the opposite of entry barriers. They impede a company from leaving an industry. Leaving an industry is often considered to high costs. Therefore, companies are forced to stay in the market even if the market sector itself makes losses. - buyers have full information. The more the buyer knows about the market, the more it is able to compare prices and seek for the best cost-benefit-ratio. - suppliers are able to integrate forward if the prices they seek are not offered by the industry. Finally, the threat of substitutes exists. Substitute products are products which fulfill the same purpose as the product of the industry and thereby fulfill similar customer needs. Almost every industry suffers from the threat of substitutes. Substitutes can be identified in many forms: They can reach from an alternative product, to process of “doing without”, where product characteristics are unimportant and omitted. They place a ceiling on the price an industry can charge for its product, whereby the potential returns are limited. The threat of substitutes is even higher the better the price- performance-ratio of the substitute is and the more buyers are likely to switch products. Hence, the highest rates of return are earned in industries where the degree of substitute products is low. As the second central question for competitive advantage, Porter alleges the relative competitive position of companies. According to Porter, three generic strategies for positioning exist: Cost leadership, differentiation and focus (see Figure 2). The choice of the competitive position is independent of the average industry profitability, in other words, companies are able to be profitable regardless of what the overall profitability of the industry may be. According to Porter, companies have to appoint only one of those strategies. Otherwise firms will not attain any competitive advantage at all. By not committing to one strategy, companies will be “stuck in the middle” which will lead to below-average performance. However, firms should on the one hand, always seek opportunities for cost reductions that do not harm differentiation, and on the other hand, they should simultaneously pursue all opportunities of differentiation that are not costly. In the end, the overall aim must be above-average profitability, regardless of the choice of strategic option. In the following, the three generic strategies are explained in detail. still aspire cost advantages as the main basis for competitive advantage, because of limited space for competition on other dimensions than costs. Certainly it can be stated that - where the focus of industry competition lies on product differentiation - increasing competition has lead to increasing importance of low cost strategies as a requirement for profitable management. Cost leadership is a strategy that aspires to produce goods and services cheaper than competitors. By following the cost leadership strategy, companies try to generate their products or services at the most competitive price possible. It consists of the search for an extensive cost advantage within its own industry, by implementing a whole series of activities to reduce costs. These activities to reduce costs consist of intensive installation of production facilities, avoidance of marginal customer accounts, the resolute use of economies of scale, strict control of costs and furthermore cost minimization in all areas of the enterprise. It can be stated that lower costs represent the central theme of the firm’s strategy. However, quality and services are not insignificant and should not be neglected. Although bearing high risks resulting from high investments in equipment, price wars and start-up losses, once reached, cost-leadership offers high rates of return, which can be reinvested in modern technology, equipment and machinery to sustain the cost leading position. The cost-leadership approach explains that, in the long run, competitiveness derives from an ability to build faster and at lower cost than competitors. As mentioned above, companies seek to achieve the lowest possible costs. Therefore, they forgo on expenses for product R&D, services, selling and advertising. Instead of laying importance on product innovations, which are only imitated after a clear risk- reduction period, they concentrate on process optimization for further cost reduction of the manufacturing process. Due to the fact that a low cost producer must exploit all methods available to reduce costs, it normally sells a standardized product with no frills. A company has to achieve and to sustain cost leadership to reach above-average performance in its industry, assuming that it is able to set prices at or near the industry average. Because of its lower costs, the cost leader is able to charge a lower price than its competitors for its products and nevertheless be profitable. Lower costs enable companies to earn profit even in times of high competition. Even if the industry is distinguished by high completion, an efficient cost position can result in over-average profits. Once the competitors have erased their profits through their rivalry, the cost leading company would still be profitable by cause of its more efficient cost situation. Cost leadership is connected to a high sales volume and a large market share to gain economies of scale. This enables the cost leader to profit from scale economies in areas such as purchasing (quantity discounts), manufacturing (mass production), distribution (mass wholesaling and mass merchandising) and financing (large firms usually attain lower interest rates). Resulting from this, cost leaders are most likely able to earn above-average returns on investment. A susceptibility of the cost leadership exists when two or more market participants simultaneously follow a low cost strategy. In this intensively competitive case, profit margins are driven down until they vanish. Another threat to cost leadership might be technological obsolescence. If the products of the cost leader do not match industry standards, customers are lost to competitors with superior products. These two factors deter many manufactures from adopting the low-cost strategy. “Differentiation means the offering of a product or service that is a perceived by the customer as somehow unique or different.” Companies try to create a monopolistic range of products, which is only offered by them. Differentiation seeks to create a product that customers perceive as unique concerning its attributes. It underlines important marketing factors such as a strong interaction of marketing channels, reputation for quality, a good company image and well-designed, creative products. Opportunities for differentiation are vast: Product, distribution, sales, marketing, services, image and technology to name a few. It is possible to distinguish between two aspects: Tangible and intangible aspects of differentiation. Two types of differentiators exist, each of them with different specifications. First there is the innovating differentiator which distinguishes itself from competitors by constantly launching new products and technology. He symbolizes the spearhead of their industry in innovations matters. Due to the strong emphasis on R&D and innovation, which results in higher customer value, he is able to charge fairly higher prices to cover the higher costs for product development. Secondly, the marketing differentiator: These firms offer an attractive marketing mix, consisting of high quality products and services and convenient locations. In contrast to innovating differentiators, they are hardly the ones who innovate. They emphasize their marketing power by spending huge sums for advertising, sales force, promotion and distribution. Of course, here the costs can neither be discounted, although they do not represent the key elements of the strategy. The firm must ensure that the higher charged price covers the costs of differentiation. High differentiation and the resulting brand loyalty of customers lower the customer’s price sensitivity. Therefore, the differentiating company usually may charge a premium price for its product which is counterbalanced by a higher degree of customer values such as quality or service. Contrary to the cost leadership, there can be more than one successful differentiator in the industry, due to the fact that differentiation can be extremely varied. The third type of generic strategy represents the most appropriate for small business units: The focus strategy. The focusing company selects a target segment in the industry and sets up its strategy based upon the needs of the selected target group. The focus strategy co-ordinates its business on target segments which are neglected, due to economies of scale, by companies that orient their strategy on a broader target market. Customers’ needs and wants can be observed on a more narrow level, so the focuser is able to align its products and services exactly to its customers. This narrow approach enables the focused companies a competitive advantage in comparison to firms that concentrate on a broader scope. The two generic strategies named above can be transferred onto the focus strategy: Cost focus and differentiation focus. Additionally, companies sometimes introduce products into a niche segment in order to use it as an experimental area for further product development. Implementing one of the generic strategies mentioned afore does not mean certain and eternal success. Once a company has established a competitive advantage through its competitive strategy, it must assure to sustain it. For the purpose of sustainability of a generic strategy, it is of particular importance that the competitive advantage of a firm prevails against threats of competitors (imitability) and industry development (durability). To pre-empt threat of competitors, a company must protect its superior performance by factors that impede rivals imitating their advantage. In order to protect the own competitive advantage, companies have to build up barriers to imitation of competitors. These barriers are easier to overcome the higher the degree of transparency, transferability and replicability in an industry is. As these barriers are never insuperable, the firm has to invest to build up new barriers of imitation. A constant ongoing process of improving the own position, either following cost-leadership or differentiation, is necessary to protect its competitive advantage. Many industries offer the possibility of coexistence of the three generic strategies as long as firms follow different ones or select different segments to focus on. However, if two or more firms choose to follow the same generic strategy at the same basis, the result is rising competition and reduced profits for every market participant. The battle of these competitors would have influence on the whole industry by reducing its attractiveness for profitability. Accordingly, the best circumstances would occur if each market participant would follow a unique strategy to gain competitive advantage and thus lower competition in general. An alternative view of how to achieve competitive advantage and to outpace the competition is offered by Gilbert and Strebel. They agree with Porter that competitive advantage is based on the two cornerstones: Lower delivered costs and higher perceived value, meaning differentiation. Nevertheless, unlike Porter, they combine these two factors in order to push a company into a superior position within its industry. They suggest companies to offer the highest perceived value at the lowest delivered costs. Therefore, Gilbert and Strebel argue that in certain cases it could be favorably to change or to combine the strategies in order to outpace the competition. An example for this is a company that differentiates through innovation: While competitors wait until a clear standardization of the new technology is established, the innovating company has to preempt its rivals by changing to a low cost strategy to skim off the profit of its new innovation. This strategic approach of combining differentiation and low-cost strategy is further developed in the Blue Ocean Theory by Kim and Mauborgne, which is examined in the following subchapter. In contrast to Porter, Kim and Mauborgne offer a differing view on strategy: They suggest pursuing a low-cost route and differentiation simultaneously by applying the key concept of value innovation. But, before going into detail on value innovation, their general view on competition is described. Kim and Mauborgne’s idea is to make competition irrelevant, instead of competing with rivals. They argue that it is more sustainable to create new demand, than to fight for existing markets and customers. To explain their strategic approach, they distinguish between red and blue oceans, which describe the overall market universe. According to their theory, red oceans symbolize already existing and established industries. Here the market space is known. Whereas the idea of blue oceans is to seek entirely new markets that create a previously non-existing demand. The conventional approach of red ocean companies is to defend their existing customer base and to maintain the established industry order. Their strategy consists of dividing up the ocean and competing with rivals for market share. In other words, their means how to achieve competitive advantage over rivals are usually based on monitoring and outperforming the competitors. As a result of benchmarking and imitating, rivals’ products and services increasingly become commodities with shrinking differentiation. With no clear differentiation and converging brands, the buying decision will be based only on price levels, which will result in price wars and shrinking profit margins. Due to cutthroat competition, markets end up as red, ‘bloody’ oceans. In contrast to this, blue ocean companies follow a different strategy. They try to develop new demand by creating new markets. These new markets are brought into being by challenging the boundaries of established industries. Thereby sometimes completely new industries are created. To lever out the existing industry constraints and with this, the traditional value-cost trade-off, companies have to make use of what Kim and Mauborgne call value innovation. As mentioned before, this value innovation is the key point of the Blue Ocean Strategy. Value innovation is the simultaneous striving for fundamental increase of customer value and lower costs for companies (see Figure 3). While simultaneously reducing cost for companies and increasing value for customers, a leap in value for both parties is achieved. This leap in value creates untapped market space for the value innovator. In areas where a company affects its cost structure and its value creation for buyers, value innovation takes place. For the purpose of cost reductions, expenditures are reduced and eliminated. Buyer value is increased by rising and creating elements, which the industry had not previously offered. Value innovation represents a new way of thinking about strategy. Unlike the conventional belief that companies are only able to create higher value at higher costs or reduce value to achieve lower costs, value innovation strives for both differentiation and low cost, thereby breaking the traditional value-cost trade-off. Disproportioned to Porter’s belief, that a choice has to be made between differentiation and low costs, the Blue Ocean Strategy combines both strategies simultaneously. A company has to put equal emphasis on both value and innovation. If companies simply concentrate on increasing customer value without considering innovation they tend to come up with incremental advancements of value. This improves value but offers no outstanding position on the marketplace. On the other hand, only concentrating on innovation without value often tends to overshoot customers’ needs. Customers need to perceive a link to value to be willing to pay for the new technology. Therefore, value innovation is only given when companies align innovation with value, utility and price. Which influence the value innovation has on creating a new market, can best be described by comparing it to the conventional strategic thinking. In the following, differences between value innovation and the traditional logic of competition will be highlighted by examining five dimensions of strategy: Industry assumptions, strategic focus, customers, assets and capabilities as well as product and service offerings. Industry conditions can be shaped and rearranged and they are waiting to be set by the value innovator. While red ocean companies see industry conditions as given and set their strategy accordingly, Blue Ocean companies do not. They seek for innovative ideas and quantum leaps in value. The traditional strategic belief is that companies must focus on benchmarking their competitors in order to achieve competitive advantages. This conventional thinking leads companies to compete at a margin for incremental market share. Following a Blue Ocean strategy companies monitor the competitors but do not use them as benchmarks. With a focus on not competing, they can discern and increase the factors that deliver superior value from all other means of differentiation an industry competes on. They do not offer certain products or services just because their competitors do, but instead they try to identify completely new sources of customer value. Therefore, although they do not seek to create competitive advantage, companies using the Blue Ocean approach, end up achieving the greatest advantage over their competition. In terms of target groups, red ocean companies must ensure that their existing customers are served while concurrently expending their customer base. This leads to finer segmentation and more customized services to meet the specific customer’s needs. Furthermore, growth is connected to higher competition because in confined markets a gain in market share for one company necessarily means another company’s loss. Contrary to this, value innovators increase customer value by trying to identify similarities of customers’ buying patterns. They do not target at a specific customer group, but instead the mass of buyers. According to the Blue Ocean Theory, a company can try to approach three tiers of noncustomers (see Figure 4): The first tier consists of “soon-to-be” noncustomers which are at the edge of the established market so they are waiting to jump in. Second tier noncustomers are knowingly “refusing” to join into the market. Finally, the third tier noncustomers are “unexplored” situated in differing markets. The concept is to convert all three tiers into a mass of new demand. Instead of focusing on customer differences Blue Ocean companies concentrate on commonalities of customers and noncustomers. By concentrating on similarities value innovators are able to approach a much broader customer base. The underlying idea is that buyers will drop their differences if they realize the significant increase in customer value. To win new customers, Blue Ocean companies stick to this strategy, even at the potential loss of some existing customers. Finally, in respect of products and services red and blue ocean companies show varieties in their offerings. Red ocean companies traditionally offer products and services in the framework of existing industry boundaries. They stick to what the industry traditionally does and what it always had been offering. Their goal is to score off their rivalry by increasing the value of their offerings. Blue Ocean companies on the other hand, are not limited by the boundaries of the existing industry and are thus able to pursue the total solution for customers. They offer products and services for buyers that fit the overall chain of the buyer’s solution, even if this takes them across industry borders into new businesses and beyond its industry’s traditional offerings. Nevertheless, it must be stated that red and blue oceans have always been concurrent and they will always coexist in the future. Conventional thinking will always exist and be a part of business. Consequently, companies will always try to outcompete rivals. But with oversupply and increasing competition in most markets, it is difficult to achieve above-average performance. In order to achieve superior performance and to discover new profits and growth opportunities, companies need to think beyond competition and create blue oceans. It follows that a better balance between red and blue oceans must be developed. Kim and Mauborgne opinion is that red oceans are still dominating because plausible tools analyzing competition have been established over time. They offer companies possibilities to compete in ‘red waters’ skillfully. Therefore, in the following subchapter, tools and frameworks that had been introduced by Kim and Mauborgne are analyzed. These measures should ease to creation and capture of new markets and blue oceans for managers. The first mean that is explained is the strategy canvas. The strategy canvas can be used as a diagnostic and action tool for building a new market space. To point out a company’s competitive position, the strategy canvas captures and to visualize offered products and services on a graph in order to point out the company’s competitive position (see Figure 5). While the horizontal axis represents the key success factors the industry competes on, the vertical axis represents the offered value that customers perceive. A high score on the vertical axis means that the company offers buyers more value and therefore invests more in that factor. Only in the case of price, a high score indicates less value for customers because it implies higher costs. By filling in the different industry offerings, companies obtain a graphic depiction of its portfolio and performance. This depiction is called the value curve. a little more for a little less, but they do not change the overall shape of the curve. In contrast to this, value innovators create fundamentally new and superior value curves. Instead of competitors, they shift the value curve of their offering by reorienting their strategic focus on alternatives and similarities between noncustomers and customers. By doing this, the firm redefines the problem the industry concentrates on and rearranges the value factors for buyers. If the innovator is successful with its new strategy, competitors will sooner or later adopt their value curve. When competitors imitate the successful strategy, the value innovator will see growth and value under attack. Instead of concentrating on gaining new leaps in value, many companies try to defend their new established customer base against imitators. This often results in a focus on rivalry and the traditional view of competition. The ocean has turned red. Therefore, companies need to monitor value curves to prevent assimilation by competitors. How long this adaption process takes, differs from industry to industry: In some industries value innovators do not face any competition for years, while other industries adopt more quickly. Especially in rapidly emerging industries companies need to innovate frequently. By continuously focusing on value innovation, companies are able to differentiate from competitors and to sustain a variation in their value curve. Rearranging the value curve may be a complicated task when a company has never done this before and has no starting point. It often demands a completely different business model in order to offer higher value at lower costs. To ease this process of challenging the industry’s strategic logic and to come up with a new model of business, Kim and Mauborgne introduced the Four Actions Framework (FAF). The FAF consists of four key questions that challenge the industry’s commonly used business model and the strategic logic behind it (see Figure 6). Managers are encouraged by the FAF to reconsider their strategic investment in value factors. As mentioned before, these value factors represent the means of differentiation for companies to compete on. By facing the following four questions companies are forced to rethink their approach on those factors in order to create a new value curve and to break the traditional value-cost trade-off. 1. Which of the factors that the industry takes for granted should be eliminated? Managers should rethink the factors that the industry perceives as given and determine whether those really increase customer value. Often companies abide on these factors, although they offer no value or even reduce value for customers. 2. Which factors should be reduced well below the industry’s standard? The second question indicates the factors that have been overdimensioned to yield an advantage towards competitors. 3. Which factors should be raised well above the industry’s standard? Industry’s compromises and limitations are discovered and eliminated. 4. Which factors should be created that the industry has never offered? Industry’s standard parameters are abandoned and new sources of value for customers are established. Summarized, the first two questions address how to reduce costs compared to competitors. By eliminating and reducing the factors that offer no or only little value to customers companies forego unnecessary cost drivers. The second two questions indicate how to create new value and increase demand. All together, these four questions enable companies to systematically reconstruct buyer value elements to offer buyers an unmitigated new experience while simultaneously driving costs down. The actions of eliminating and creating are especially essential because they push companies to change the existing value-cost ratio and thus make competition irrelevant. Nevertheless, asking the full range of question - not picking out just one or two - is of high importance to profitable growth and new demand. By applying the changes in the FAF to the strategy canvas, firms gain a completely new value curve (see Figure 7). The Eliminate-Reduce-Raise-Create-Grid (ERRC-Grid) is an advancement of the FAF which illustrates the application of changes a company needs to adapt. It gives an immediate overview of the changes that need to be conducted to create a new value curve (see Figure 8). While in the FAF managers were asked to rethink their strategy, the ERRC-Grid encourages them to act. The clear arrangement of the four factors forces managers to attach importance to every field, so an unbalanced allocation of changes is prevented. Because of the figure’s eye-catching illustration, it encourages a high degree of engagement in its application among managers. The key utility of the ERRC- Grid is to reconsider every factor the industry competes on in order to break the old value-cost trade-off and to assess a new strategy canvas. The new shape of the value curve has to point out three important qualities: Focus, divergence and a compelling tagline. It has to focus on factors that deliver value for customers and which the firm can clearly communicate. By focusing on value factors the strategy will not get stuck in trivialities. Furthermore, the strategy must differ from those of the rivals in order to show its uniqueness and thereby offer customers a surplus in value. Finally, the strategy must be summarized in a convincing slogan that advertises to the buyer an apparent message of the added value. Devoid of these attributes, the strategy will lack in clarity, comprehensibility and emphasis. Thus these three characteristics serve as an initial performance test to operability of the commercialization of the new Blue Ocean Strategy. Once a company has chosen a strategy, it must be implemented in its operative business. Therefore, the next chapter of the thesis will analyze how the determined strategy gets implemented and commercialized within the new product development process. New Product development starts with the understanding of what an innovation is. The basic meaning comes from the Latin translation ‘innovare’ which means ‘to make something new’.162 163 164 Since no universal definition of innovation exists, the term leads to a vast variety of interpretations (see Appendix A for a detailed list of definitions). However, most approaches refer to the terms “novelty” and “change”. An innovation involves two general stages: An invention of something new and its industrial or commercial introduction and exploitation. An invention can be characterized as a first occurrence of technical phenomenon that involves the discovery of a new principle, while an innovation represents an economic phenomenon that involves the commercialization of the invention. Inventions can either be serendipitous or planned, in other words: Based on the result of a strategic research project. Sometimes, it is hard to distinguish between inventions and innovations because they are closely linked. However, while most of the inventions never reach the stage of exploitation, many attempted exploitations fail to deliver economic success. Therefore, inventions have to be selected very precisely in terms of whether they promise economic value, are technically convertible and can be realized in practice. After choosing the invention the production and market introduction process takes place. Because new ideas and concepts have little economic value per se, to be profitable. they have to be incorporated into a product or service. The end result of the selection, development and commercialization process is a realized innovation. In business, innovation generally implies a change which includes a degree of novelty (newness). cp. Porter, M. E. (1999), p. 71 - pp. cp. Porter, M. E. (1980), p. 35 - pp. cp. Miller, D. (1986), p. 269 - pp. cp. Porter, M. E. (1998), p. 20 - pp. For example those industries that arose from the internet like online shops or online newspapers. Many companies only focus on “rising" and “creating” and unconsciously worsen their cost structure and the convenience of the offering. cp. Brockhoff, K. (1994), p. 27 - pp.